I planted this Clematis 'Nelly Moser' vine last year. As you may know, nursery stock usually starts as a spindly little plant and probably won't bloom the first season. Now that it has had a year to settle in, it is blooming for the first time. I knew what it would look like, but I wasn't expecting this. That blossom is 7.5 inches/19 cm across, and I am tickled to death with it. I read that it also has attractive seed heads, so I still have that to look forward to. Previously, I had a Clematis armandii 'Apple Blossom' in this spot. It was a vigorous evergreen variety with beautiful foliage. In my garden, however, it was a sparse bloomer and never looked like the pictures. The blossoms were always hidden in the leaves. As soon as the rain hit them, they would turn brown and fall off. It was not a good choice for my situation and I decided it had to go. 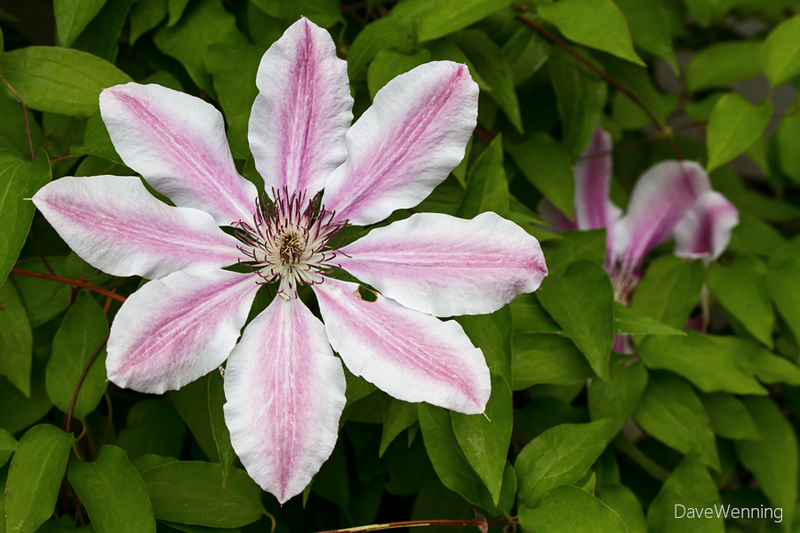 This Clematis is growing on the east side of the house near the south corner. It gets morning sun and afternoon shade. From what I have read, this exposure should provide for long-lasting blooms. It is now just under four feet tall with four big blossoms. By next year, it should put on quite a show.